After Joe Morrow held the puck in at the left point, Blake Wheeler picked up the loose puck and moved to the slot before sliding a pass to Mark Scheifele, who one-timed a shot from the left circle that beat Sergei Bobrovsky blocker-side and in. Seth Jones fed a pass across to Ryan Murray at the left point. Murray sent a pass across the ice to Artemi Panarin in the right circle and he snapped a shot glove side on Connor Hellebuyck and in. While on the power play, Seth Jones found Artemi Panarin on the right wall at the Jets blueline. Panarin moved into the right circle before sliding a pass across to Josh Anderson in the slot. Anderson fired the puck blocker-side on Hellebuyck and in. Mason Appleton picked up the puck inside the Columbus blue line, moved into the left circle and let a backhand go that bounced off the glove of Bobrovsky, into his pads, and trickled just over the line. 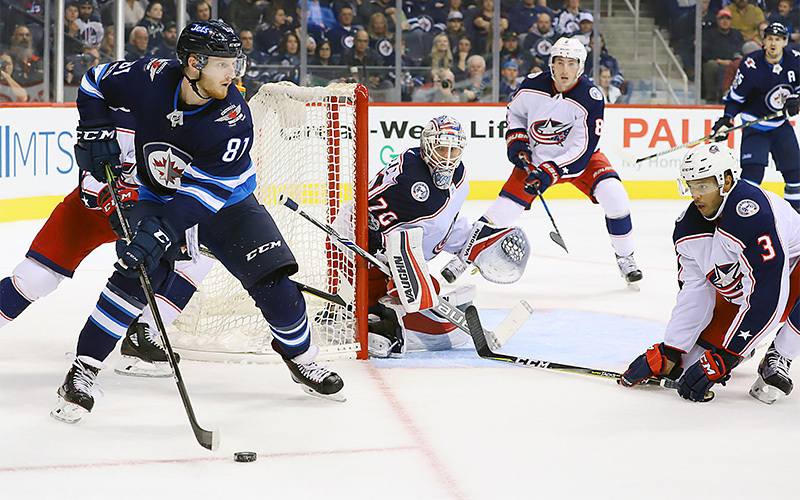 Alexander Wennberg carried the puck into the Jets zone before dropping it to Oliver Bjorkstrand, who snapped a shot over the glove of Hellebuyck and in. While on the power play, Tyler Myers had the puck along the right wall, moved into the circle, and slid a pass across to Jack Roslovic in the left circle. Roslovic quickly fired a wrist shot blocker side on Bobrovsky and in. Jacob Trouba sent a pass along the boards to Bryan Little behind the Columbus net. Little fed a backhand pass to Kyle Connor in the slot and he quickly snapped a shot over the blocker of Bobrovsky and in. Improve to 33-16-2 overall with the win. Won their sixth consecutive game at Bell MTS Place and improve to 19-6-2 at home this season. Improve to 13-6-1 against Eastern Conference opponents, including 8-3-0 against the Metropolitan Division. The Jets have scored four or more goals in nine consecutive victories. Went 1-for-3 on the power play tonight and are now 15-for-35 (42.8%) in their last 12 games at Bell MTS Place. Improve to 18-5-2 when scoring first this season. Improve to 20-8-2 when being outshot. Improve to 6-13-0 when trailing after the second period. Scored his third career goal in the second period. It’s his first career goal at Bell MTS Place while playing for the Jets. Was the top faceoff man for the Jets, winning eight of his eleven faceoffs tonight. Led the Jets in ice time tonight with 25:12 TOI. Scored his team-leading 26th goal of the season in the first period. It’s his first goal in five games. Registered his 54th assist of the season on Scheifele’s goal. He is three assists back of NHL assist leader Nikita Kucherov. Scored his fourth goal of the season tonight and has two goals in his last three games. Scored his fourth game-winning goal of the season tonight. Assisted on Kyle Connor’s third period goal to register his 20th assist of the season. It’s the 11th consecutive season Little has registered 20 assists. Picked up a pair of assists tonight. It’s the fifth time this season Trouba has registered two-or-more assists in a game. Led the Jets with five blocked shots tonight and leads the Jets with 170 hits overall this season. Registered his 11th assist of the season tonight and has registered an assist in each of his last two games.